We are located in Northern California and for over a decade we have specialize in hand raising exquisite, high quality AKC registered French and English Bulldogs. We breed for quality not quantity and produce all colors of the breeds including; fawn, cream, red, brindle, pied, blue, chocolate, black/tan, blue/tan, chocolate/tan, lilac, lilac/tan and merle. We are a dog loving family and we fell in love with the bully breeds many years ago and focus on researching, nurturing, caring for and breeding the highest quality French Bulldogs. Each one of our dogs are unique, ranging in color, size, personality, and champion lines. 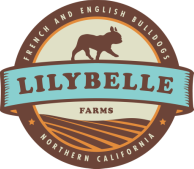 All of our LilyBelle Farms™babies are raised with love, in our home, as part of our family. 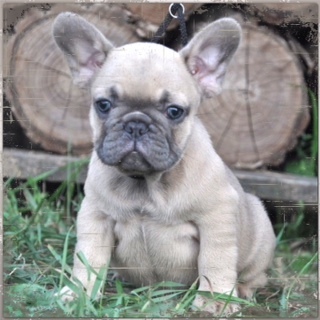 Our French Bulldogs are handled, pre-spoiled and socialized in our home with love. We feed only natural, high quality food to our dogs. Our dogs receive the highest quality veterinary care which includes health exams, and 4 panel health testing. Our French Bulldog and English Bulldog puppies receive comprehensive health exams and are up to date on all of their health needs including vet check ups and immunizations before they go to their new homes. Our LilyBelle Farms puppies are raised in our home with love and come with a one year health guarantee. We don't ship our puppies but offer a puppy nanny delivery service hand carrying your baby to a local airport nationwide.